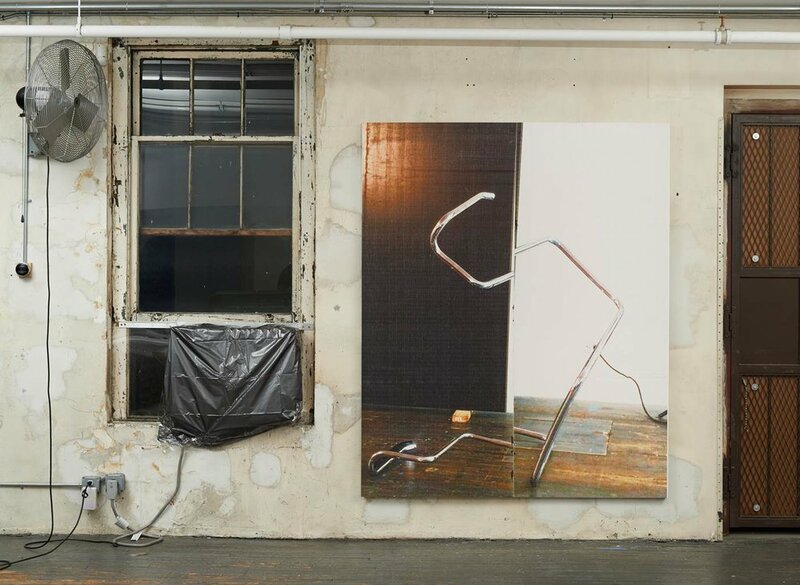 Wade Guyton’s North Wall, Bowery Studio, WG3505 (2016) is a new wall-sized, site-specific photographic mural. The mural, printed on adhesive vinyl, is a reproduction of a wall in Guyton’s New York studio. The image is a nearly 1:1 scale view of the North wall of his studio. The image includes the door of the freight elevator, a painting (WG3505), a window air conditioner covered in plastic, a fan, and a Nest thermostat. The painting depicts one of Guyton’s sculptures, a bent Breuer Ceska chair, standing in front of one of his black paintings propped up on 2x4s. The actual painting in the image will be in his exhibition at Le Consortium in Dijon from June 25 – September 25, 2016. What plane are we on? What do we see? Painting, at first threatened by the digital world, is now embracing it and using the technical evolution - starting with the peripherals and the constantly-updated software. a surprising one for him, as he has never before undertaken such a thing in his entire career - with a sculpture that uses the techniques he employs in his painting. He is not merely limiting himself to a « correct » response to the challenge before him, he is creating a new setting for the physical and material accomplishment of his work by giving it an entirely new corporeality. 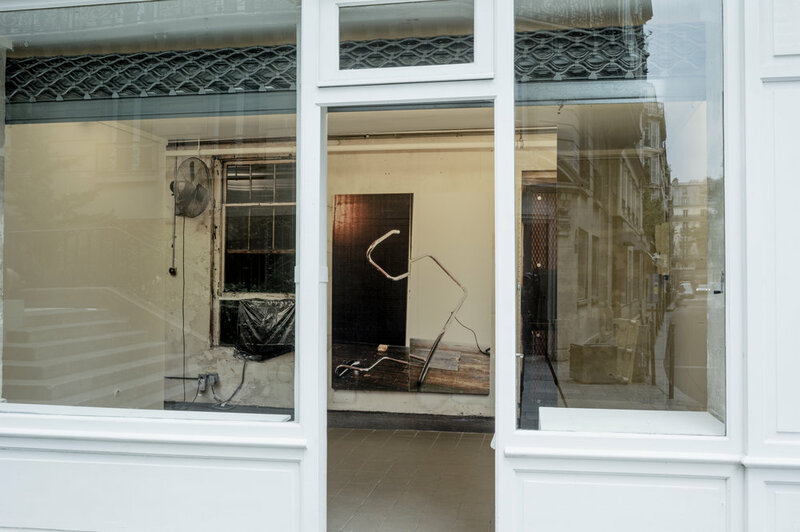 As he physically transposes his studio into the space, so he transforms the rue Saint-Bon. The movement is not the result of a mere fictional teleportation, but a consequence of a very subtle image processing work, to which we must pay careful attention. Here the universal question is once more reiterated - one that art history has always wrongly believed to be resolved at each step – that of the value of the image used as a medium, organizational system, environment or as an object in itself. Even the theme - long believed to be hackneyed, yet never exhausted - of the conjuring power of performance is restored without inhibition. Obviously, a life-sized representation such as this transposes the workshop in its nakedness, or its raw truth. Naturalistic details abound, with an emphasis on their physical materiality: the white wall marked with plaster retouching; the window, allowing the presence of nighttime to be felt in the harsh light of the workshop; the air-conditioning unit, sealed off with a trash bag but supplemented by a fan in the top left of the work; or the rustic installation of the electrical and telephone cabling. But, in the center of the wall, and which seems absolutely natural in an artist’s studio, hangs a painting. Its presence instantly projects us into a new level of reality, both identical and different. Concrete perception has switched to virtual representation. If we choose to overlook it for a moment, it is in order to turn our attention towards the floor and the dismantled remains of a ‘Ceska’ chair by Marcel Breuer. This is a sculpture made by the artist in 2002 - ‘Untitled sculpture Action’ (Chair). Against the wall, raised on blocks, we can make out the scanned fragment of a black painting from 2007 - ‘Print it black’. As the title suggests, the impression is not only instrumental: it is the transformation of an intangible digital file into something that takes shape, acquiring a distinct, but not separate, physical materiality. If we return to the main piece, ‘WG3505’, we notice that the totality of its elements is assembled, and projected, onto the outline of the painting with a slight delay - which corresponds to the tension of the canvas and its double passage through the ink-jet printer. The image on the table is syncopated through the digital printing process, subject to the vagaries of positioning as well as technical defects or errors. For the painting, printed using the powerful and massive machine that it the Epson 9900, does not seek to be a glorification of contemporary « techne », contrary to the aspirations of a generation that had seized upon digital painting (Albert Oehlen G Richter ...). Rather, Wade Guyton seeks the imperfect and the accidental. He is at ease with the distortions that stem from failed print jobs, discovering within them the manifestation of an irreducible or resilient materiality, escaping by their nature from the overly ambitious codification of word- and image-processing software. In the space between the two, within these shifts in meaning, an uncommon semantic system returns to life and takes up it place. Unexpected variations allow him the opportunity to invent a new pictorial writing vocabulary and to create with it, as would a composer or a conductor, new harmonies through interplay with these machines. The reappropriation of the accidental is a way to return to the « kairos » of the ancient Greeks: the opportune moment that gives meaning to time. It is the search for the point-of-inflection, indicating the moment for action. Instead of aspiring to control the technique and the machine, it is a more subtle control – a control of the will to accommodate vital imperfections and accepting failure; to turn the accidental into a source of creation, yet taking the utmost care not to let it wander excessively, into what would then be the very opposite of art—a loss of meaning. It is even more legitimate to speak of writing, with respect to this new type of composition, as Wade Guyton, instead of using image-processing software, paradoxically prefers to use Microsoft Word and its components - running on OS X - to process his painting. He refuses to passively accept the commercial purpose imposed by the designers of the hardware and software he uses. His particular uses allow him to subvert their intended usage, contaminating these industrial objects to avoid the pitfalls of an alienating reduction in the «industrial production of cultural goods», denounced in hitherto powerless theories of Horkheimer and Adorno. The search for imperfection, the will to accept errors, manifests in his case a discreet humanist struggle in a world dominated by machines and, by extension, by the companies who take it upon themselves to set fixed uses for these machines. Silently, the artist shows that new resources are available, that the emotional and semantic redefinition of the world is still the vocation of art, and that it can find, even within the most unfavorable contexts imaginable, a lexicon of great wealth. Wade Guyton has not chosen to take his studio for his theme by chance. The central painting, ‘WG3505’, shown on the Wall, happens to be precisely the focus of the sequence formed by the thirty original works constituting his major monographic exhibition at The Consortium in Dijon, and of which the presentation at the Wall also marks the conclusion. ‘WG3505’ is presented in Dijon in various sizes. In Paris, it reaches its maximum physical fixity as a sculptural installation. In taking the decision to establish a powerful link between the two, Wade Guyton shows that the mutability of the performance is not impaired, and that the figurative nature of its current cycle does not render it less conceptual than more abstract works previously. In all cases, the artist undertakes, in the performance of the painting, the dispersion of its elements to thus collect the «emptiness» necessary for its development. The fragmented and syncopated painting carries within it an essential invisibility, but also a methodical organisation. In Paris, as in Dijon, the ultimate representation of the subject will remain out-of-reach. Whoever should look closely will discover an image released from its physical setting, the printed surface having become the vector of the parameters of the paint cycle and its manifesto.